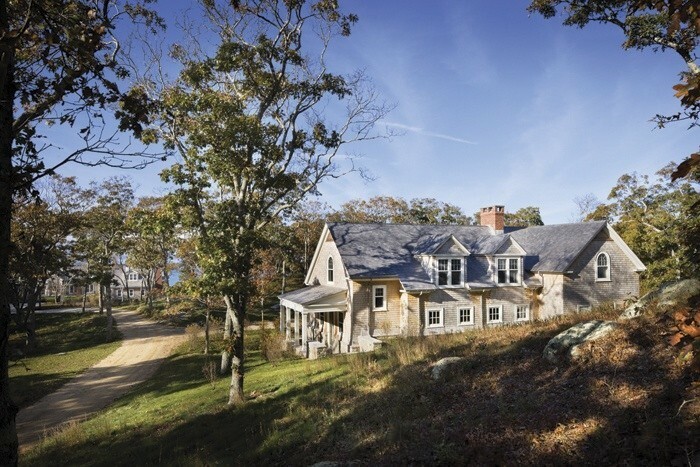 Gem of a Home on Martha’s Vineyard…. 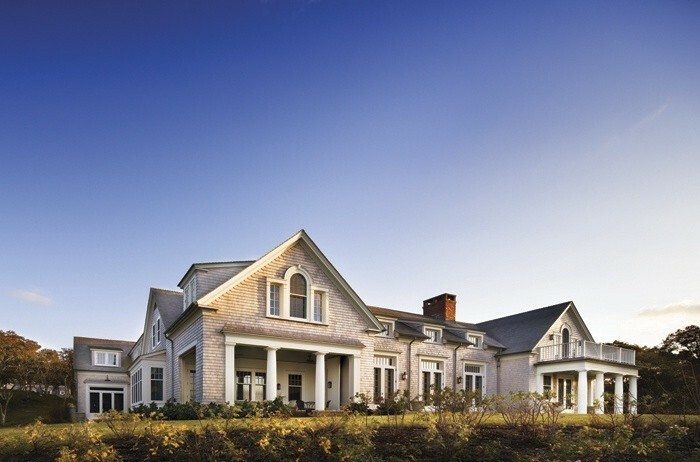 You are here: Home / Architecture / Gem of a Home on Martha’s Vineyard…. 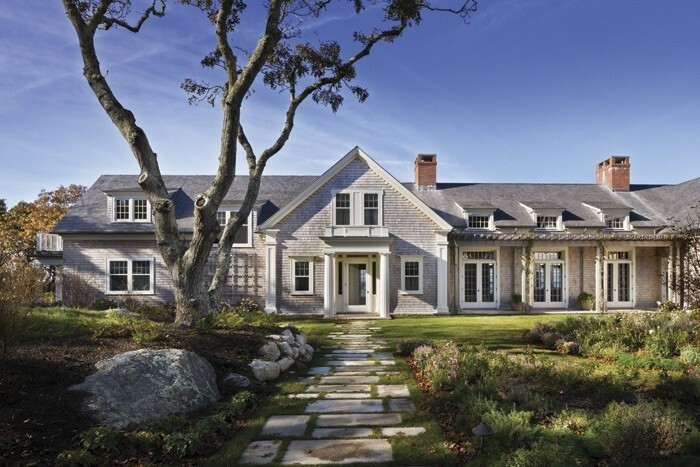 I am a huge fan of Shingle style, as I mentioned in one of my first posts. I get so excited when I come across one like today’s home. The architects of this Martha’s Vineyard, MA home are Ferguson & Shamamian, a design firm I have followed and admired for a very long time. Mr. Ferguson worked at Parish-Hadley and you can see this influence in his work. Mr. Shamamian began his career working with Robert A.M. Stern, absolutely one of my favorite architects. Mr. Shamamian also worked at Parish-Hadley, where he met and eventually formed a partnership with Mr. Ferguson. They seem meant to design together, and it is easy to understand their design aesthetic considering their early influences, while also adding their own stamp. This home by the sea has an understated elegance, yet touches that clearly say this is a home with nautical elements quietly peppered throughout. I also love blue & white Chinese porcelain, and as I looked through this home, every once in a while I thought to myself…..gee, a lovely piece of blue and white would look lovely here. Blue & white porcelain is almost as addictive for me as horses and dogs! What ya gonna do. Enjoy! 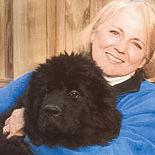 By the way, I will soon introduce you to my canine companions, both past and present. I have lived with some incredible characters over the years, especially when I was showing…….. The siting of this house is perfect. 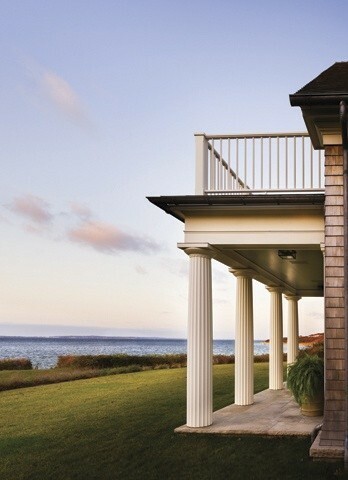 I love the low profile….it makes the home “settled” on the land, lending a sense of permanence. Notice the grass paths that lead down towards the water. The front, with eyebrow dormers. If you look closely, you can see the water through the windows. Notice the trellis to the left of the front door, and the pergola to the right over the series of french doors. It must be stunning when the vines are blooming. You can also see traces of the gardens on each side of the walkways. The drive in allows the home to slowly reveal itself. The library with just a hint of nautical decor in the trunk with rope detail on the front, used as a sofa table, and with the wood boat in the window. 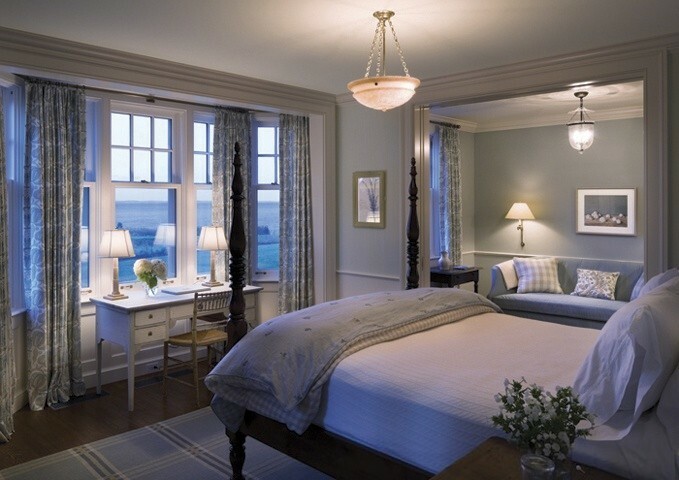 The use of the two small sconces/swing arm lamp on each side of the window is a detail repeated throughout the house. The wood tones and the soft, muted colors are welcoming and comforting. 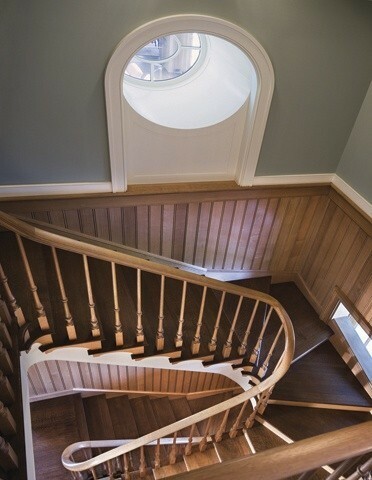 The staircase is another subtle nod to a nautical style, with a staircase that reminds one of the stairs in a lighthouse. The deeply set window like a porthole. 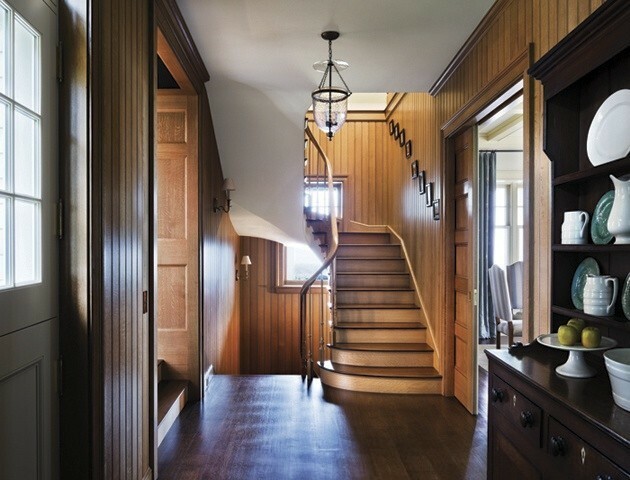 Notice the window at floor level……The darker wood stair treads set off the wood paneled walls.The curves of the stair rails are beautiful. Another” clear through the house” site line from the opposite end, that draws you in. You can see the dining room and maybe even the ocean view from here. The shape of the door and the ceilings add architectural interest without competing with the stunning views of the ocean right outside the doors. Soft blues, creams and comfortable furnishings – it would be difficult to want to get up and move from this bedroom! Delightful small sitting room in the bedroom, and again, views of the ocean from the bed as well at the desk. Without a doubt I would have difficulty concentrating on writing my blog if I was working there, but what a great place to be distracted! 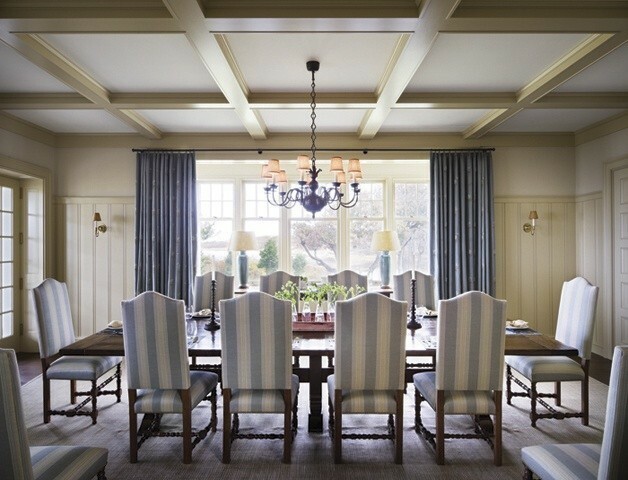 I love this dining room, with muted colors and patterns, views, and beautiful details…..the bead board, the coffered ceiling, large bank of windows (and french door and more windows to the left) allowing light to pour into the room. I would have to add 2 large pieces of Chinese porcelain to the left and right of the windows though! Sorry, the designer in me, and my love of blue & white…..Can’t help it. Another view of the dining room, with the staircase visible from the left. I really like the introduction of a pop of turquoise color on the lamps on the table in the window alcove. Restrained formality……got to love it. The woodworking of this barrel vaulted entranceway is beautiful. The built in chest and closet are again, an understated nod to what one would find on a ship. The small sconce over the dresser repeats throughout the house, e.g. in the dining room there are 4 that are visible. The dark stained floors set off the white and muted paint colors. Another bedroom in the softest pastel color, repeated in all the fabrics. 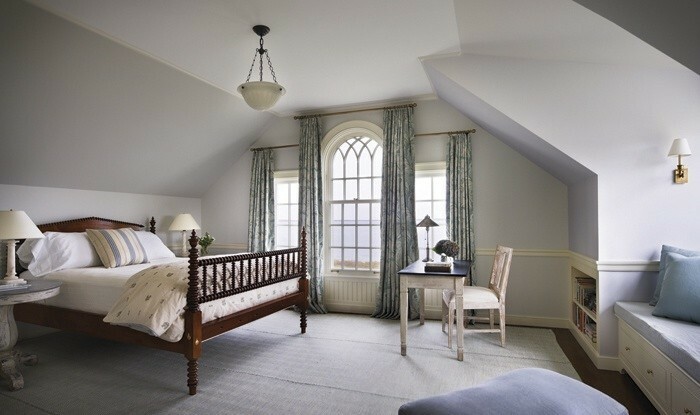 The pattern in the drapes and pillow add some weight and interest to the room.The window and the bed are the co-stars, yet not overwhelming at all, and allowing the eye to travel happily to the view through the window of the ocean beyond….the real star. 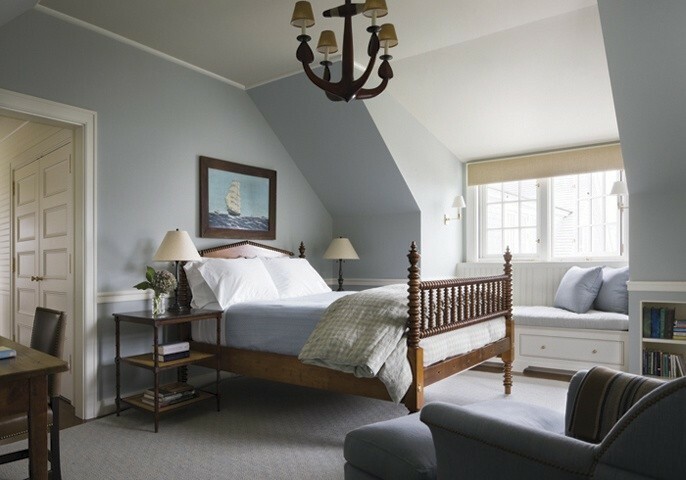 Another bedroom, same colors, same pretty bed, but a different chandelier, and a clipper ship work of art over the bed. Notice the repeating light fixtures over the inviting window seat. The stain color on the wood couldn’t be more perfect. Window over the fireplace mantel and the eyebrow dormers let in tons of light. 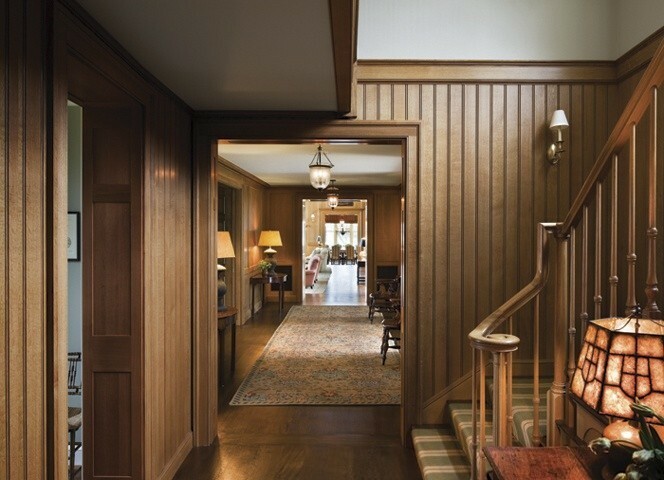 The trim around all the doorways is craftsmanship at its best. Full view of the living room. 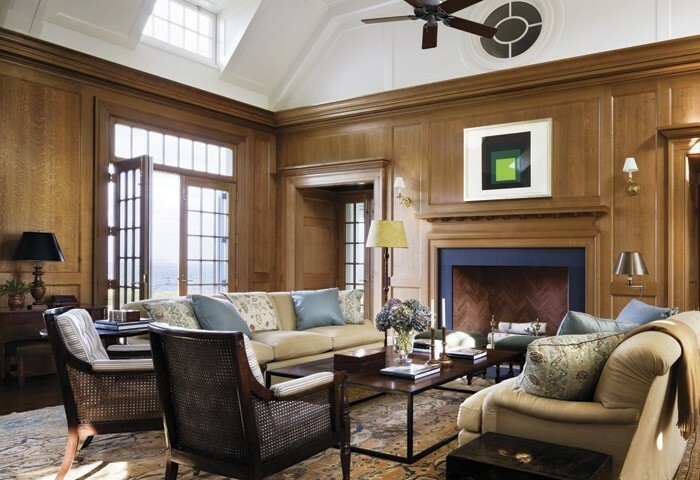 Although a large room, light flows in from multiple sets of french doors, while the dormers flood the room with even more. The two seating arrangements allow for both a large group of people or an individual to feel comfortable despite the rooms size. The vaulted ceiling is in wonderful proportion to the wall height. A touch of Modern art above the fireplace mantel add an unexpected pop of color. 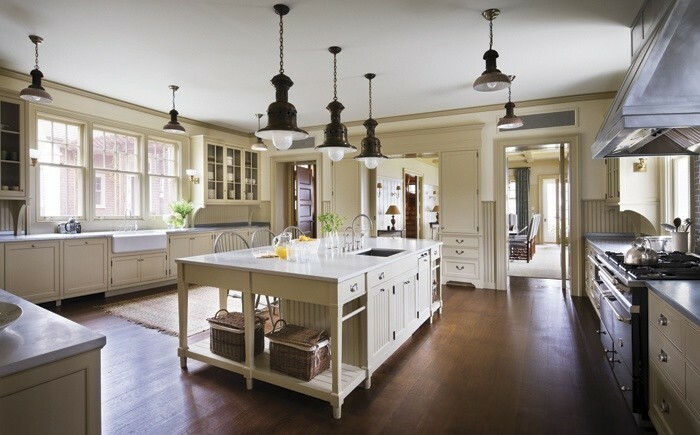 Love this kitchen, but this is where I would definitely add some blue and white porcelain! This is a cook’s kitchen, tons of space and can easily accommodate several people working together to prepare a meal. Despite it’s size, it still feels inviting. Notice the two large openings into the dining room, and the hallway to the far left. Another view of the kitchen. Tons of storage, and lots of counter space. I say you can never have too much counter space or light. 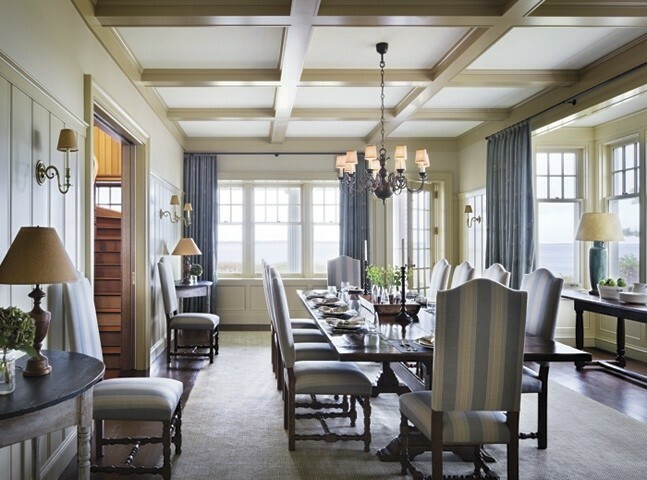 The glass over the built in buffet allows for even more light to pass through from the living room and the hall beyond, as does the transom, which appears to be operable, opening to let summer ocean breezes in. Another view of one of the staircases. A side entrance. Genius that the width of the hall was designed to allow for a long bench with storage beneath to serve in place of stair rails. You can see the stairs going down just behind the bench. Windows brighten both the hall and the stairwell. The slate floors can take whatever sandy wet feet can deliver. 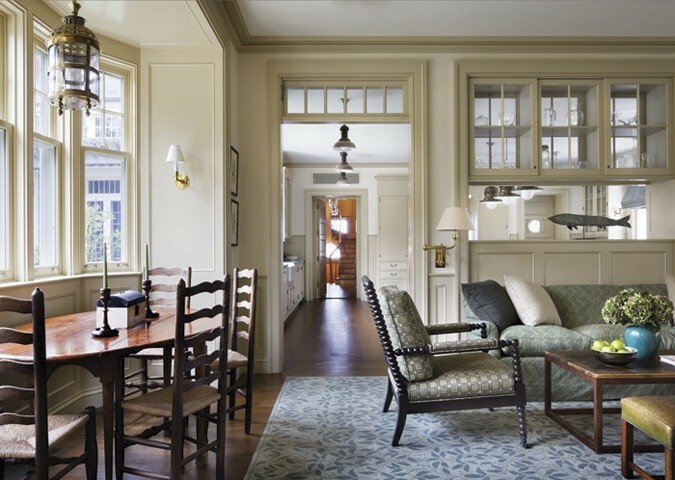 Last glimpse of a home that is understated but elegant, comfortable and inviting. With the view, what is not to love. I loved it enough that I was praying I could win the lottery. Only problem? I don’t buy lottery tickets! Love this home but I’m not sure about the extensive use of stained wood coupled with light walls. Made some of the rooms too dark for my taste.